Tearing through the speakers like a swamp monster summoned from some dark cosmic morass, Texas riffmasters Wo Fat unapologetically blast out a southern fried, blues-infused version of Psychedelic Doom, conjuring up visions of hoodoo shacks, prowling undead, hell hounds at the crossroads, Lovecraftian cultists and ghouls, and worlds beyond where the riff reigns almighty. Wo Fat rose from the deep and began their psyche-doom-adelic quest circa 2003 when guitarist Kent Stump formed the band with drummer Michael Walter and bassist Tim Wilson. Their goal was to create a music that is crushingly heavy, but that stays within the paradigm forged by Black Sabbath, Jimi Hendrix, ZZ Top and the other 70’s greats. A music that allows for improvisational freedom, extensive jamming and interplay between the three members yet that, at the same time, allows them to crank out monolithic, fuzzed out, downtuned riffs, all the while staying true to the haunting blues that wail and moan deep within their souls. Their 2006 release, “The Gathering Dark,” which was the first documented, hazy, smoke-filled trip in their ongoing Riff Quest, gave us the blueprint that they would expand upon in later albums. This blueprint was a mixture of dark, Mississippi Hill Country blues, extended acid guitar freakouts and heavier-than-Led, Sabbath-style riffing. Wo Fat took things up a notch with their next album, “Psychedelonaut”(2009) and again with 2011’s “Noche del Chupacabra,” continuing to offer up even weightier and more crushing riffage coupled with moments of spaced out trippiness. Both of these albums garnered much critical acclaim and helped to establish them as an up and coming force to be reckoned with in the Stoner/Doom world, with “Noche del Chupacabra” landing on a number of Top Albums of 2011 lists. 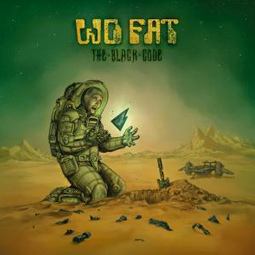 Now, Wo Fat has joined the Small Stone roster and, after another psychedelic journey to the hoodoo shack, is offering up a new epic album – “The Black Code” – five hefty slabs of classic Wo Fat analog fuzz, but this time, with a more sci fi related motif, full of cyber-visions of evil code, alien artifacts, doors to alternate dimensions and premonitions of digital horror. Musically, Wo Fat is continuing further down the road of melding structured, groove-laden riffing with free-wheeling open improvisation, relying on heavy interaction and communication between the three musicians to take the music to new heights of sonic heaviness. And not just a one dimensional heaviness. Heaviness in groove, sound and feel as well as riff. This is not cold, sterile, machine-like metal. This is organic, earthy metal that is full of that elusive, deep, “way back yonder” funk that is so often the missing ingredient in this digital age in which we live. No synthetic designer pharmaceutical here, but a pure, expertly cultivated, homegrown strain of Texas riffage.